I knew nothing about Marble Bar, but when I saw it on the map for some reason I knew I had to go there, so here we are. 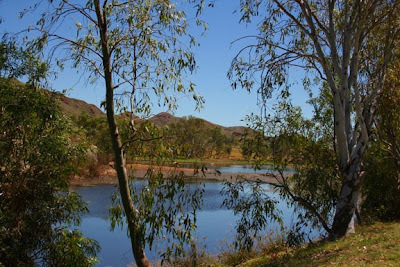 Marble Bar is about 200 kms south of Port Hedland and is renowned as being the hottest town in Australia. The town holds the record of 160 consecutive days with the temperature over 38.7c in the sweltering summer of 1923/24. 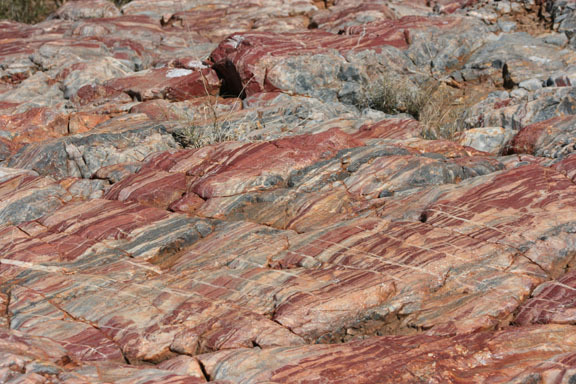 The Guinness Book of Records also lists the highest maximum to have reached in Marble Bar as 49.2 c.
An extraordinary colourful Jasper Bar crosses the Coongan River just west of the town. It was this Jasper Bar which Nathaniel Cooke, while searching for gold, mistook for Marble that gave the town the name Marble Bar. There is a $100,000 fine for removing or taking Jasper from the Marble Bar pool. 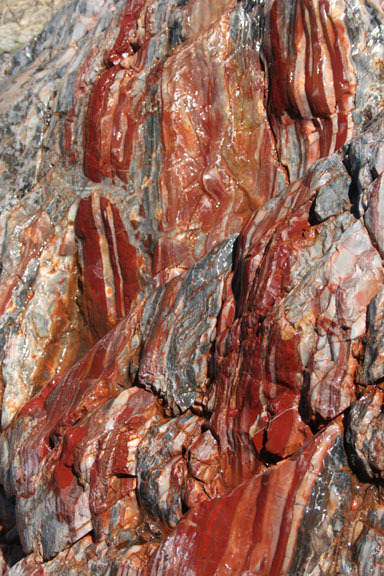 When the rock is dry it looks beautiful but it really shows itself off when its wet. So I used all my water I should have been drinking on the rocks. Luckily there is a Jasper Deposit area 4kms out of town where you are allowed to take samples. I'm heading there tomorrow with a hammer. I think I would like to be a fossicker!! 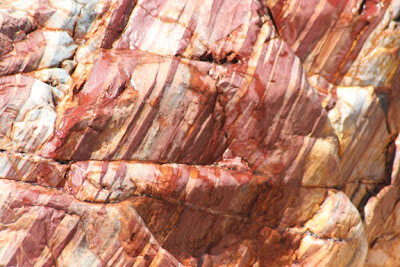 this is what the rock looks like without any water on it. The Comet Gold Mine was founded in 1936 by Tommy Starr when he discovered a large golden ore body. 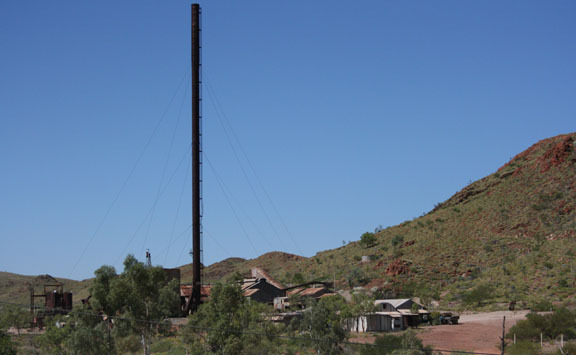 He named the mine Haley Comet Gold Mine because his surname was Starr, but it was then known as Comet Gold mine. The mine is no longer a working mine and you cannot enter the area due to the presence of asbestos and the buildings being unsafe due to deterioration. One special point of interest is the 75 meter high chimney, which was recognised as the highest in the Southern Hemisphere. Another interesting attraction just out of town is at the Horizon Power lookout. It's not so much the lookout that grabbed my attention it was the sight at the Marble Bar Pippunyah Solar - Diesel Power Station. 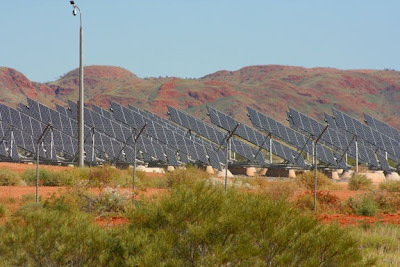 The power station is powered by 1350 - yep 1350 - solar panels which actually follow the path of the sun, delivering between 60 and 90 percent of Marble Bar's daytime power needs from solar energy. I don't know why a lot more towns in Australia don't get their power this way, it's not as if we don't have a lot of sunshine.